Guys, I am SOOO excited about today post. 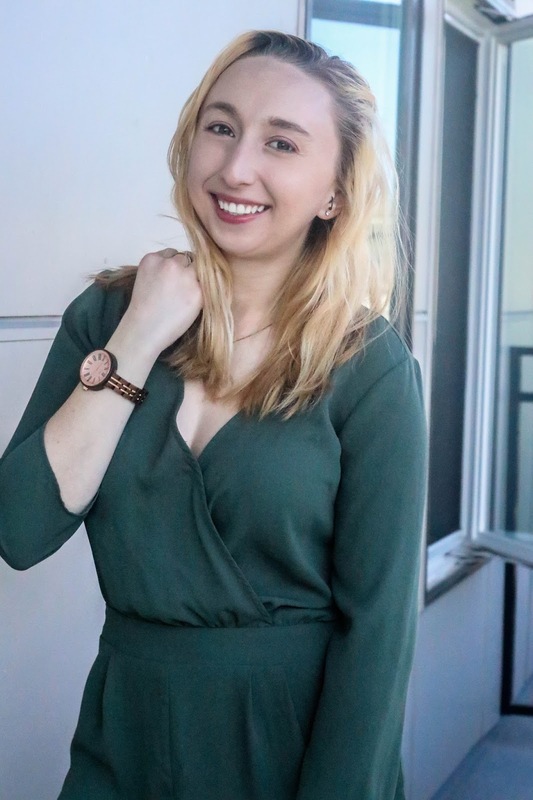 Not only did I get to play dress up all weekend long and create three perfect "weekend" type outfits for you, but I also got to work with Jord Watches on this post which includes a giveaway at the end of this blog post. 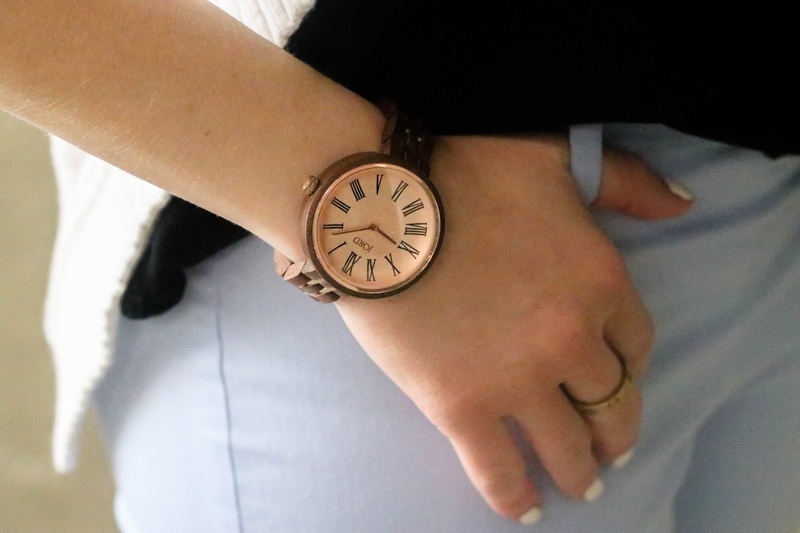 I love Jord Watches because of the beautiful natural wood finish on all of their time pieces. 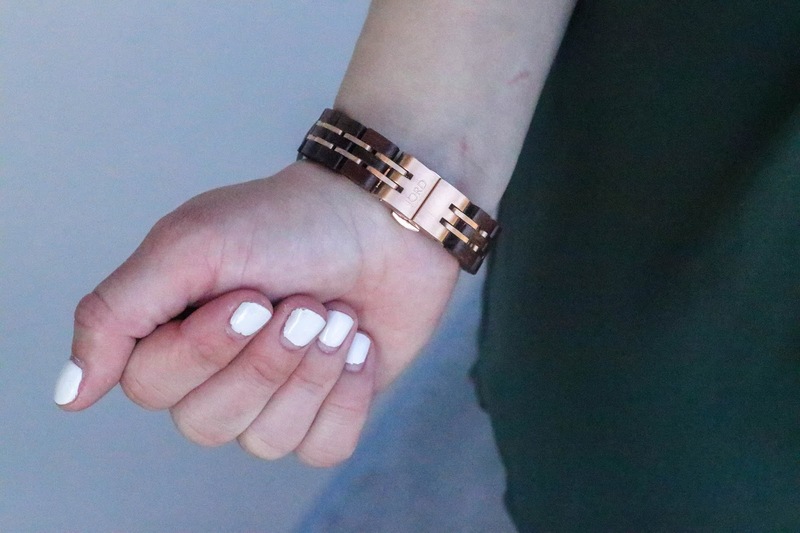 They are simple and go with any outfit! This particular one is my favorite because of the rose gold face and the Roman numerals versus traditional numbers. The rose gold also intertwines with the entire band piece. I wear a lot of gold or rose gold jewelry so I was very excited to add this to my collection. 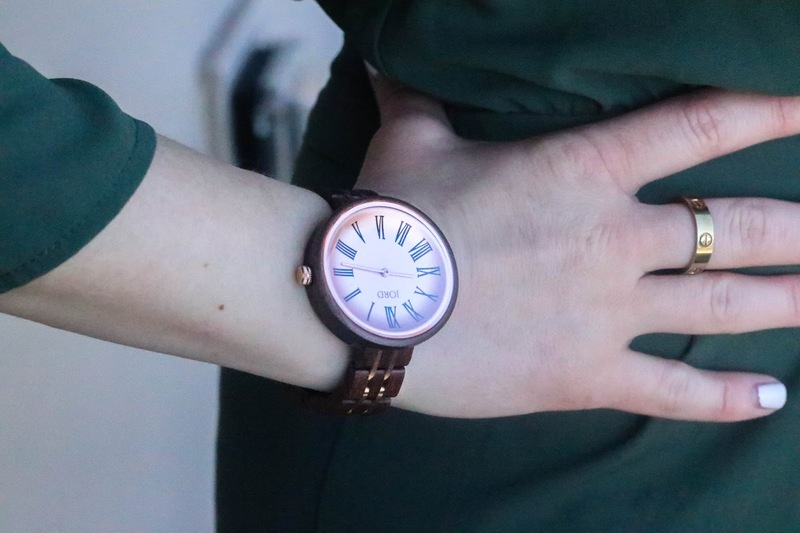 Jord Wooden Watches are so incredibly unique and are made with 100% natural wood. My Cassia is one of Jord's most unique pieces in the newest collection. The bezel-less design with a Roman dial on the face. Its 13mm long band and a 37mm face. There's a domed sapphire crystal attached to the wood case to protect the rose gold finish on the face. As I said before, the wooden band is intertwined with metal links. This sleek look is inspired by the Scandinavian street style. 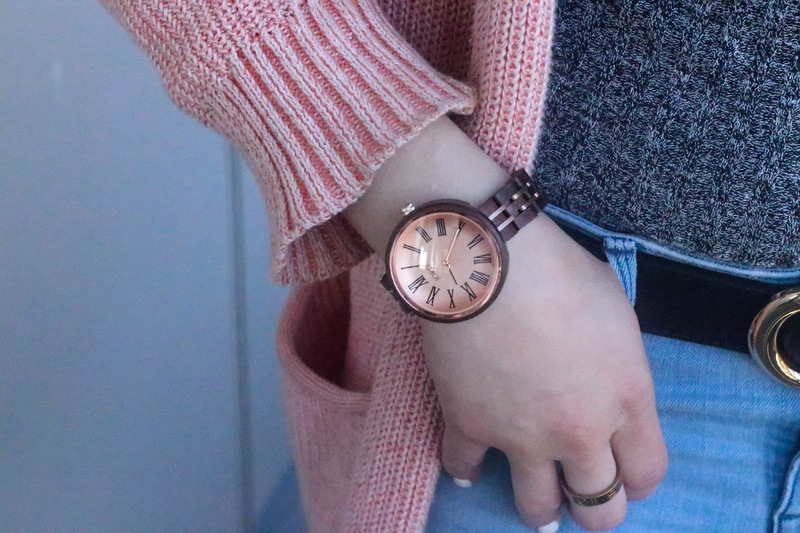 With proper care, your wood watch can be worn for many years to come. The biggest enemy of wood is sudden changes in temperature and humidity. This means if you leave your watch in a car on a hot sunny day, the high temperature has the ability to swell the wood and cause it to crack. Same with leaving it in the car on a particularly cold day or night, the cold will shrink the wood, putting pressure against the glass and pins and could cause breakage at those points. Humidity control is also important. Too much and the wood will absorb the water and swell, too little and it will dry out the wood and shrink. Swelling and shrinking increase the possibility of cracking at the time and in the future. SO, when you are not wearing your watch be sure that it is inside, and also protected in either its original packaging OR in a watch or jewelry box to protect it from an overly wet or dry environment. Additionally, the best thing you can do for the wood of your watch is make sure it is properly conditioned, protecting the wood from the elements. We recommend Tung Oil or Lemon oil both of which can be found at hardware stores, or online. RECOMMENDED: Our team can size your watch for you prior to shipment. Simply visit the page of the watch you are interested in buying and click on the "Custom Sizing" link located beneath the "Series Options" section. Take your JORD watch to your preferred jeweler or watch repair shop to have them size it for you. Upon receiving your wood watch be sure to note the instruction card provided. Wind the watch at least 15-20 times prior to wearing it. After the initial winding, your daily activity should be sufficient to keep the watch wound, IF worn every day for a minimum of 8 hours. Lack of sufficient movement or inconsistent wearing of the watch may require additional manual winding. As this is a mechanical watch, quartz watch accuracy cannot be expected. If your watch is consistently fast or slow regardless of proper winding and wearing, and you have surpassed the warranty period, we recommend taking your watch to a reputable jeweler or watch repair store and having them service the watch which should include: cleaning, oiling, and regulating the movement. HOW CAN I ADJUST THE DATE & TIME ON MY WATCH? Step 1: Pull out the crown. Turn crown to move the hands forward (clockwise) to set the time. Set the minute hand approximately 5 minutes ahead of the desire minute marker, and then turn back to the same marker. Step 2: Push the crown back to the "IN" position. Step 1: When The Second hand reaches the 60th second mark, pull the crown to the "OUT" position. Step 2: Turn the crown to move the hands forward (clockwise) until you see the date (for date only) or both day and date change (Midnight). Step 3: For AM time, continue to move the hands forward until the minute hand is approximately 5 minutes ahead of the desired minute marker; then turn back to the same minute marker. For PM time first advance the hands past 12 o'clock midday, then set the time. Step 4: When the time standard that you are using reaches the 60th second, push the crown to the "IN" position. Step 5: For normal date or date displays, pull the crown to the "intermediate" position (one "click"). Turn crown one way until the correct date appears. Push the crown in. NOTE: The calendar should not be changed manually between 9:00 pm and 6:00 am. As this could cause an incorrect display which must be corrected later. ARE JORD WATCHES WATER RESISTANT? JORD watches are considered to be splash proof. Normal wear and use can include kitchen activities, a day on the beach, the gym, etc. However, full submergence in water is not recommended both for the integrity of the movement and the wood itself. Excessive moisture exposure can result in a diminished flexibility in the bands wood links. If this occurs, allow the watch to dry for 1 to 2 days to allow the wood links to dry and return to their natural size. DO YOU PROVIDE CUSTOM ENGRAVING? Yes! JORD offers both watch and box engraving on select models. There is a customization fee of $35 to engrave the backplate of your watch or $45 to engrave the wooden watch box. Company logos, handwritten messages, standard text, and uploaded graphics can all be engraved. Our engraving team will immediately begin working on your design. For this reason, engraving change requests must be submitted within 1 hour of placing your order. A $10.00 engraving change request fee will be charged for requests submitted after the 1 hour. Due to the unique nature of each timepiece, the engraved text on the backplate may not align with the face of the watch. 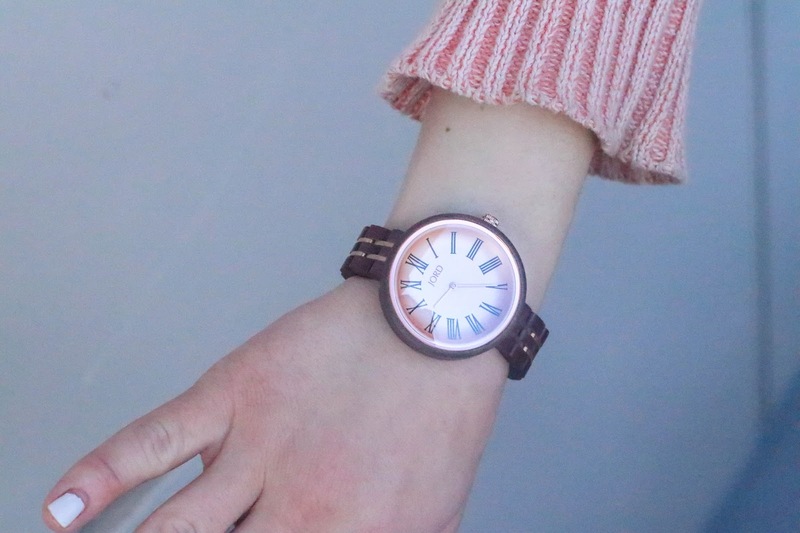 Each wood watch by JORD is warranted to the original purchaser to be free from defects in material or workmanship at the time of delivery for a period of no longer than twelve months. To maintain this limited warranty, the product must be operated and maintained in accordance with the care and operation instructions. Abuse, mechanical damage, alterations, or scratches due to abnormal wear are not covered by the JORD limited warranty. 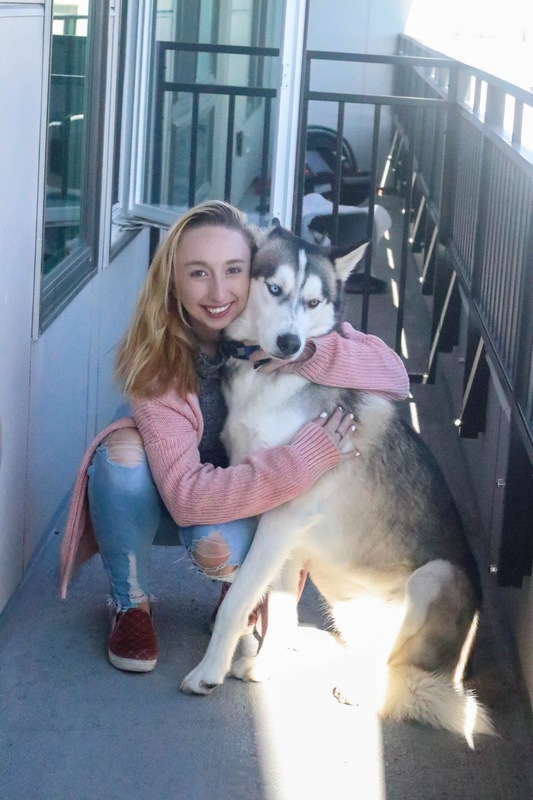 Further, JORD will not be responsible for loss or damage connected to the use of its product nor the life of the battery. If you purchased your watch within one year and you need it repaired, simply please visit our warranty claim page to request an RMA number. Upon completing this form, we will review your request. Please allow up to 24 hours to review your information. Once your RMA is approved, we will send you an RMA number and shipping instructions via email. If the repair request is due to a manufacturing defect, we will repair/replace the timepiece free of charge and cover the return shipping. For United States based customers, we will provide return shipping service if your RMA was issued within 90 days of your original order. For customers outside of the United States, you will be responsible for returning the watch back to our facility; however, we will reimburse you up to $20.00 USD for the shipping if your RMA was issued within 90 days of your original order. A valid postage receipt should included in the RMA box or a scanned copy sent to support@woodwatches.com. If the watch was deemed to be damaged due to misuse, our watchmakers will repair/replace the timepiece for a nominal fee. Our team will inform you of the repair fee prior to processing your request. For JORD wood watches that utilize a quartz movement a battery replacement may eventually be needed. The JORD repair team will gladly replace your battery. Simply complete an RMA request and one of our repair specialists will get back with you quickly to let you know the costs and timeline associated with replacing your battery. You may also visit a reputable jeweler or watch repair shop and have the battery replaced. We do not suggest that JORD owners attempt to change the battery themselves. Extra links and replacement parts can be ordered online by using our additional links order page. HOW DO I GET MY WATCH REPAIRED AFTER ONE YEAR? The JORD repair team will certainly repair your watch after your warranty expires. Simply complete an RMA request (be sure to provide photos of your timepiece if applicable). One of our repair specialists will get back with you quickly to let you know the costs and timeline associated with repairing your watch. Yes. JORD wood watches are shipped all over the world free of charge. I decided to pair my Jord Cassia watch with 3 outfits this weekend. One on Friday, one on Saturday and one on Sunday. 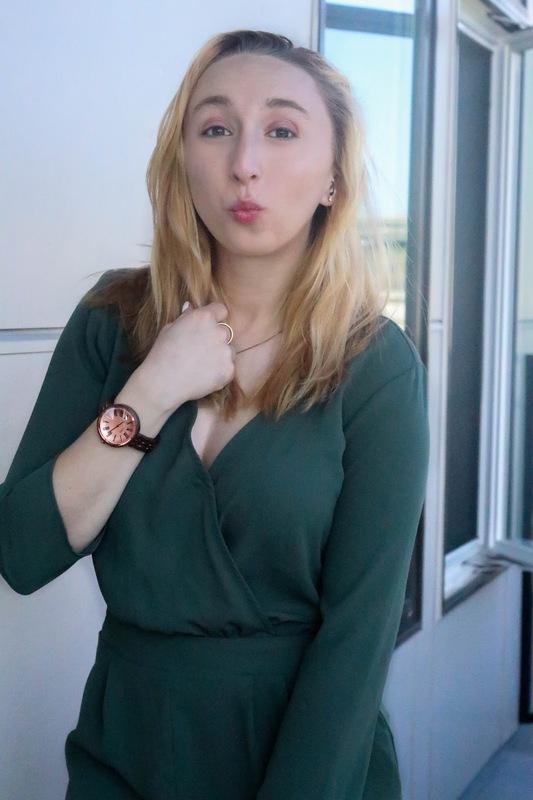 My first outfit is a typical outfit that I would wear to the office and my timepiece paired perfectly. 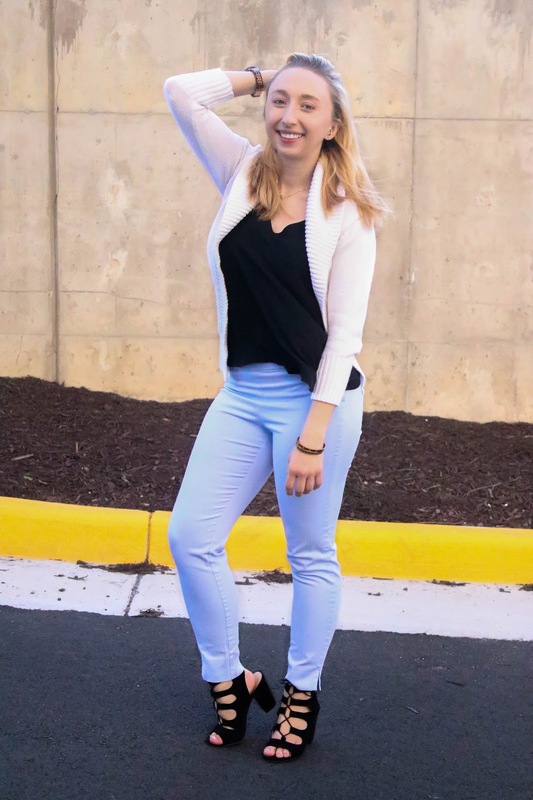 I wore my favorite pale blue work pants from H&M. I love their work pants collection and I own so many pairs in so many different colors. I also wore a simple pair of black heels that I got at Ross, but their Kristin Cavallari Chinese Laundry brand. Since I got them at Ross, I think they are an older brand but I found similar ones here. 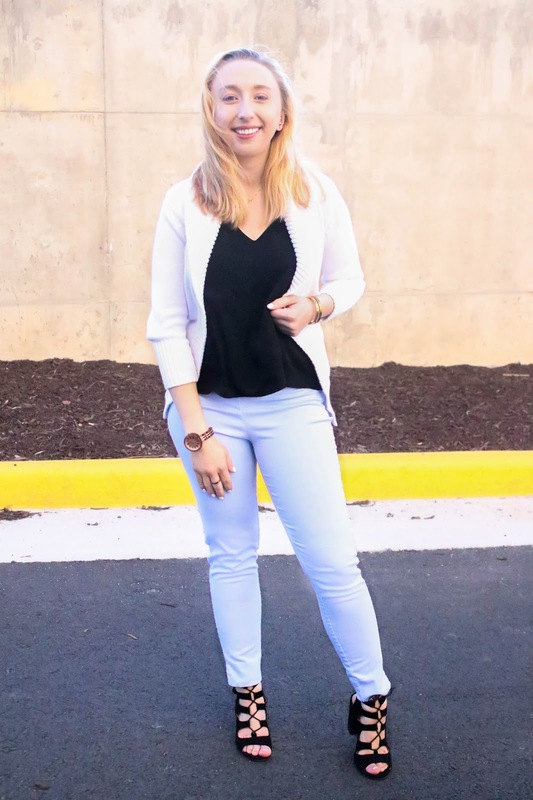 For the top, I wanted to keep it simple and I just added this black tank I got from H&M years ago, seriously this top goes with everything and a white cardigan since it’s still pretty chilly in Virginia. For my jewelry, I didn’t want to take away from my Cassia watch so I stuck to my staple Cartier love ring, nameplate necklace, and my Cartier love bracelet. The rose gold from my Cartier jewelry went so nicely my Cassia watch! I loved how simple the look was as well as how professional it looks. 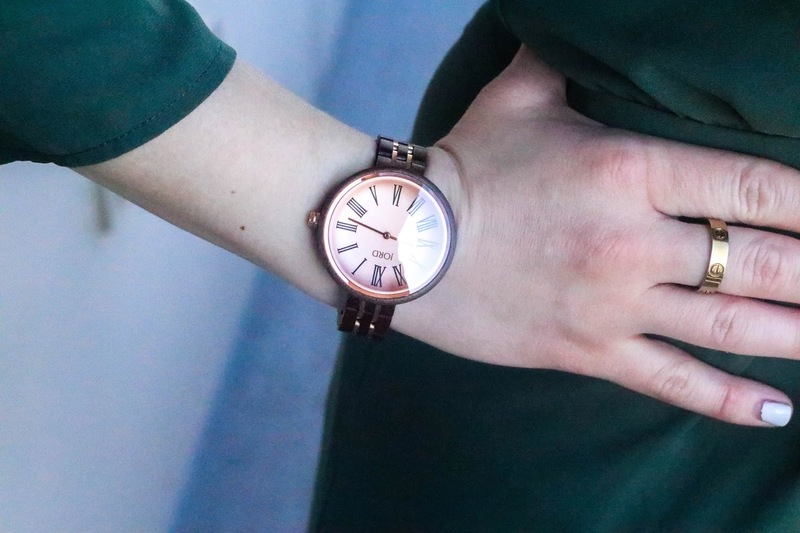 On Saturday, my friends and I were going out on the town and I paired my Cassia Jord Watch to be the staple of my outfit. 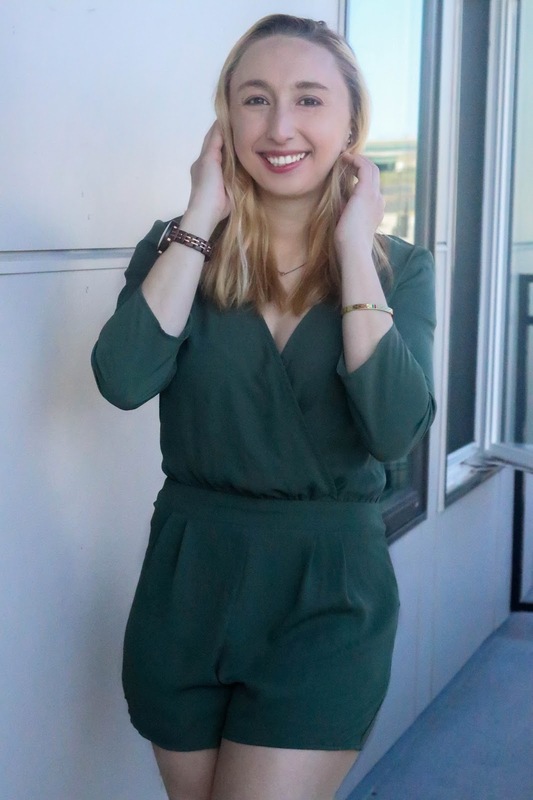 I decided to wear my go-to romper from Forever 21. This has been one of my favorites (as seen in other blog post) for a while now and it never fails. 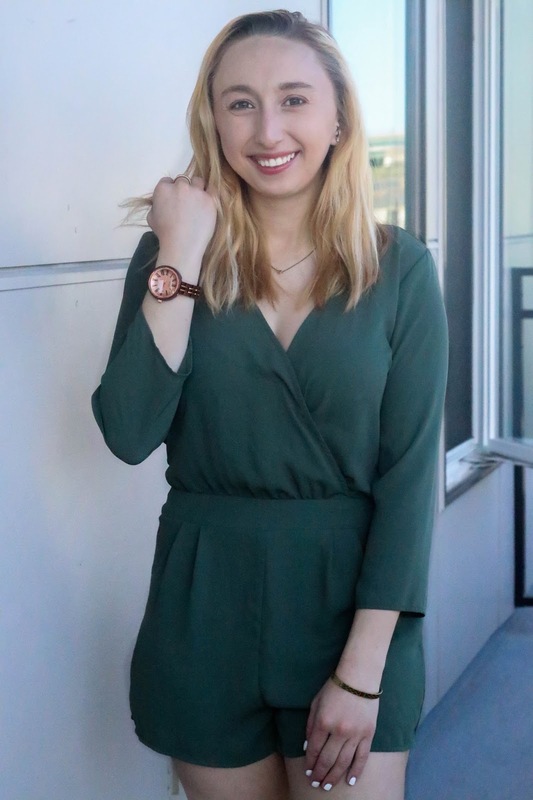 This olive green color looks really good with rose gold accessories. I let me watch fly solo on my wrist and just wore this very dainty gold plated heart necklace that I got from Target, it was a set of two and I got one for my mom and I for Mother’s Day. I received so many compliments on it because it's such a unique piece. On Sunday, I knew I would be running errands all day so I wanted to be comfortable yet stylish. 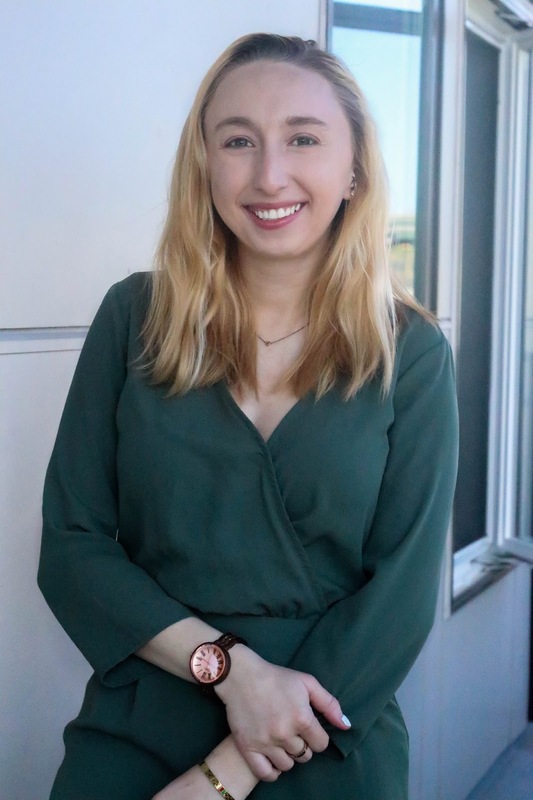 I wore my current favorite jeans from Target, grey turtleneck bodysuit I got off Amazon, my black Gucci belt, a pink cardigan from Target, and my pink Steve Madden slip-ons. This is probably one of my favorite outfits that I wear so often, but it’s just so comfy and stylish! I don’t like to wear too much jewelry when I run errands because it just feels like too much sometimes, so the only piece I wore was my Jord Cassia watch. The rose gold matched the pink PERFECTLY! Plus, it was nice that when my hands were full of grocery bags I can just look at my watch to check the time. 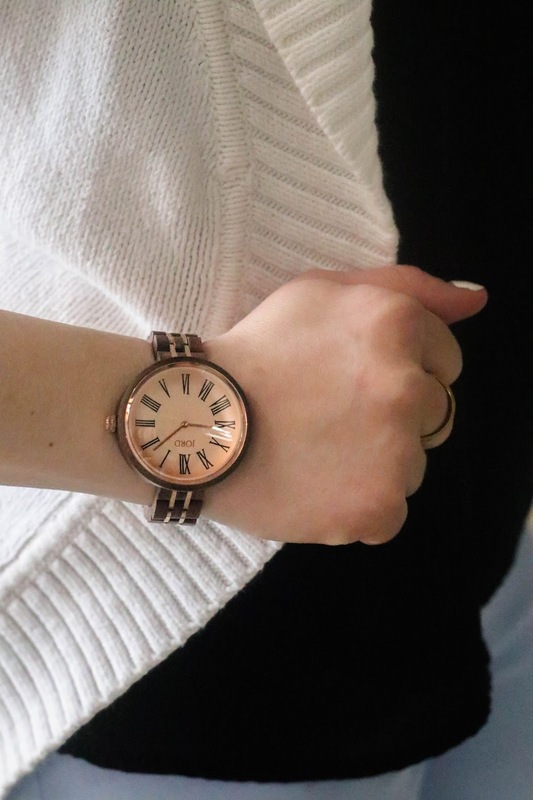 Overall, my Jord Cassia timepiece is paired so well with simply jewelry and it will always be a staple in my collection. It's the perfect day to night or office to happy hour watch. No matter how you choose to wear it, it will always stand out. To view the women's watches click here and to view the men's watches click here. Now, for the fun part.... GIVEAWAY TIME! 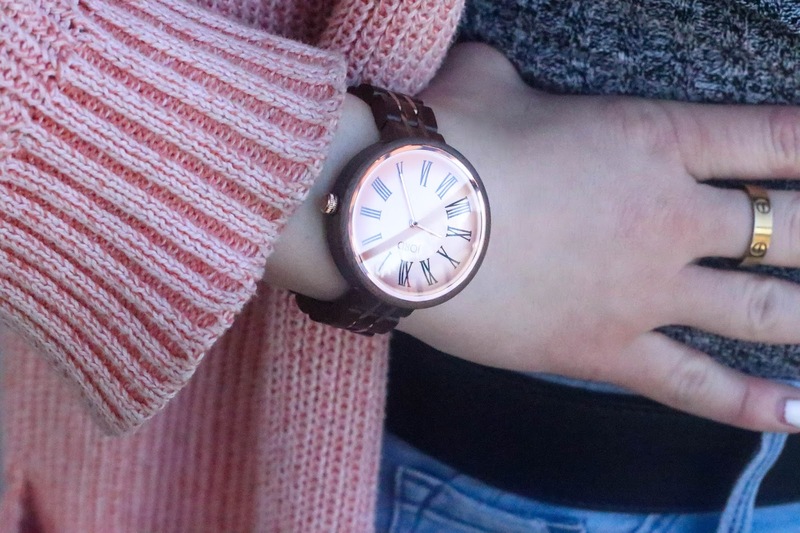 If you want your very own Jord Wooden Watch then enter this giveaway! The giveaway will close April 29th, 2018 at 11:59pm. The $100 code will expire on May, 13th, 2018. Good luck everyone and let me know if you win!